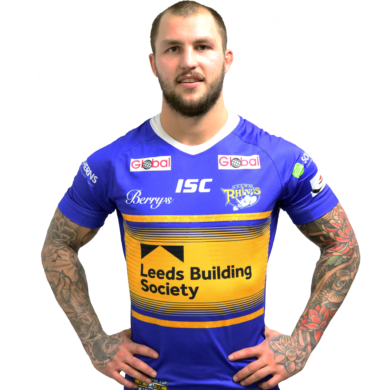 Luke returned to the Rhinos in 2018 on loan from Featherstone Rovers, where he equalled the all-time rugby league record for tries in 17 consecutive games set b Leeds winger Eric Harris. Luke originally made ten appearances for the Rhinos between 2014 and 2016 before leaving the club. His form in the Championship with Rovers, where he was consistently the top scorer once again brought him to the attention of the Rhinos coaches and he came back to Leeds during the 2018 season. His short spell with the Rhinos, during which time he collected five tries in ten appearances, earned a new deal ahead of the 2019 season. Luke is an enthusiastic player, with a lot of skill in attack as well as a tough defensive game. Before joining the Rhinos he was at Hull where he started out as an Under 16s Scholar before signing his first professional terms once he turned 16 and went onto impress for their U18’s and U20’s In 2011 he was selected for the England Academy side to take on the Australian Institute of Sport. Whilst at Hull he worked part time as bus mechanic and was once called to the rescue of his team mates when the Academy team bus broke down on the way to a pre season training camp in Scotland. Luke along with his two brothers Tom and Jack are all products of the Featherstone Lions amateur club. Luke spent the start of the 2014 season on loan with Wakefield where he made two appearances before returning to the Rhinos and making his first team debut against Huddersfield Giants. He also made 34 appearances for Hunslet on dual registration during his first spell at Leeds.